listed as Type IC and is suitable for direct contact with insulation. Suitable for Wet Locations. • Galvanized steel construction. • Housing adjusts for ceilings up to 1-1/4” thick. • Painted, extruded aluminum heat sink designed to facilitate efficient heat dissipation for superior thermal management and reliability. 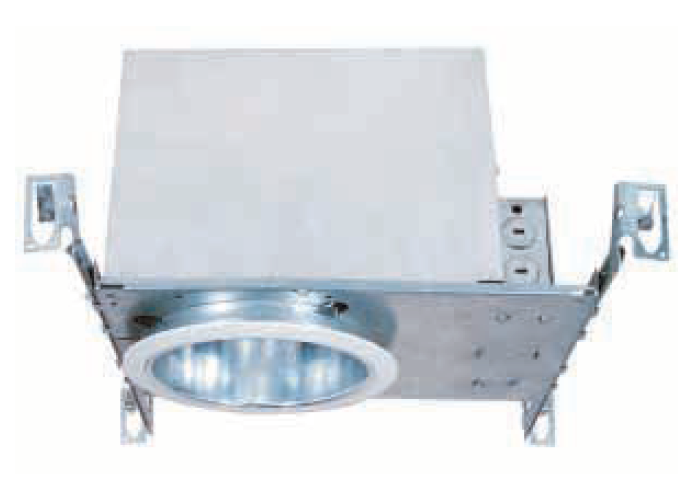 • LED engine includes LED, heat sink and lens assembly. • Heavy gauge aluminum reflector anodized in clear haze or white paint finishes. Multiple trim styles and finishes are available. • Universal, 120~277V input, high efficacy drivers with dimming capability by a Triac 120V low voltage electronic dimmer switches or 0-10V, Triac & ELV dimmer switches. • Drivers feature power factor >.90, THD <20% with integral thermal protection to sense over temperature or electrical issues. • Driver mounts externally to the module to allow future replacement or upgrading if desired. • Listed for through branch circuit wiring. (Max.8 No 12 AWG 90° branch circuit conductors: 4 in, 4 out) • (5) 1/2" knockouts with pry-out slots and (4) knockouts with Romex cable clamps. • Ground wire provided on J-box. • 24” Bar Hangers provide stability and support on joists and T-Bar Grid ceilings. • Housing can be positioned at any point within 24” joist spacing. • Score lines allow easy “bend & snap-off” shortening for 12” joist spacing. Options • Emergency battery back-up : Available in mounted to fixture or remote, adjacent to luminaire (consult with factory for space requirements).